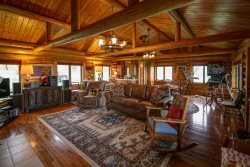 This spacious three bedroom and family friendly Beaverhead Condo offers an amazing location. Enjoy the convenience of slope side living with its amazing location to the mountain mall and Yellowstone conference center. Un-clip and unwind with the White Wing beginner trail nestled just 20 steps from your condo and warm up next to the wood burning fireplace. With a spacious kitchen and two living spaces this large condo sleeps 8 and is the perfect home to entertain the whole crew!